Thanks for coming to visit and for any comments you leave. I appreciate it. *bows* Please feel free to ask any questions, I will be happy to answer. 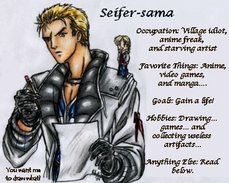 I have been drawing since I was eleven (anime drawing... I drew before then) so that means I have been working at it for about eleven years now... Long time hobbies kill. :P Just kidding. The first anime I ever watched was actually an old anime movie; Unico. I watched a bunch of those (by accident of course... no one knew what anime was then) Sailor Moon was the first big one that I got into. It inspired me to start drawing. I used to draw TV still screens from the show until I finally leanred about the Internet. Anyway my drawing sprung from there. I continued watching shows such as DBZ, Trigun, and Cardcaptor Sakura the list goes on. Anyway now here I am... still into anime. My currnet big project is a manga I have been working on for years. The story is nearly ready to where I can really start working on it. Well I suppose that's it. Thanks for reading. IThis is going to every drawer out there if y intrested me and my friend are looking for drawer to help us in our manga/anime.i dr but am not in the professional status pm m intrested. Hello. What program do you use? Usually I use CS3 to color my images. Thanks for asking. Would you mind doing a collab with me? It's for my sister. It would be a picture of her and Jealous from the manga Ultimo. If it's okay I'd like to do the drawing. It's a christmas present for her and I am looking for great color quality such as yours. If you don't do collabs under any circumstances I understand. Please let me know. Thank you for your time. Hi! :) I was just wondering if you'd would allow me to publish some of your fanart in my online magazine called Fangasm (info on my profile). It's a free magazine, so I wouldn't be able to commission you or anything, but what I see in your gallery is fantastic, and I'd love to have some of it up to help give the zine a little color. It's still in the works, so the site kinda looks like crap right now, but I'll have it up and running and pretty within the next week or two. XD Thanks! I just wanted to let you know that the magazine is up and running! I've listed you as our featured artist of the month. ^_^ If you could help promote us, that would be great! Of course! All due credit will be given. Thanks very much!